In the Vatican's approved Catechism books it states the following regarding Purgatory. "Augustine (Enarration on Psalm 37, no. 3) speaks of the pain which purgatorial fire causes as more severe than anything a man can suffer in this life, "gravior erit ignis quam quidquid potest homo pati in hac vita" (P.L., col. 397). Gregory the Great speaks of those who after this life "will expiate their faults by purgatorial flames," and he adds "that the pain be more intolerable than anyone can suffer in this life" (Ps. 3 poenit., n. 1). In other words, it's all about fear. If the powers that be in Rome can convince their flock they alone have the truth (which they have done) then their people will bow to them and trust them feeling they have no other choice. For Rome, that has been the norm for centuries. But we are now in the last days when we have the ability to check their claims with the written Word of God thanks to the Bible being printed in every language known to man. Long gone are the days of Roman prelates standing before the people as the sole bearers of the truth. Today, as prophesied, they are now seen in the light of truth and as prophesied they are the most evil men to ever walk this earth. The Bible clearly says our Heavenly Father is a "God of love and peace" in 2 Corinthians 13:11 as well as many other verses in the Bible. But for centuries Rome outlawed the Bible so as to prevent the people from knowing the truth about how loving a God He truly is so as to cultivate a mindset in the people that believed the God of Heaven was a tyrant who demands pain and suffering of His people before they can ever enter into Heaven. That lie also allowed the priests to be violent to the people without recourse for many centuries because the loyal Catholics thought that type of anger was the norm for the Father in Heaven. But now that we have Bibles in hand, does that really sound like a loving Father? No. It sounds more like the dying god of this world who as prophesied runs the Vatican as his earthly headquarters. That being said, why do the Popes of Rome declare that when a Christian dies that they must first enter into the torments of Purgatory when there is not a single Bible verse to back that up? Again, it's because most never had Bibles before to see their priests openly lied to them. But now that we do have Bibles, and as prophesied the man of sin has been exposed wherein everyone can see his evil acts from child molestation to homosexual brothels bought and paid for with Vatican money, who on earth will believe these men when they claim doctrines like Purgatory exist when anyone with a Bible can prove they're lying? Well.. that's the key. Most won't open their Bibles. 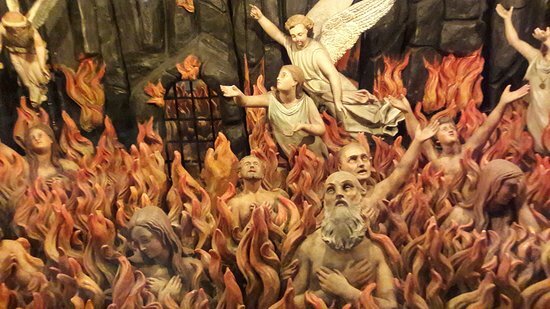 Purgatory was invented so the Popes and prelates of Rome could control the people. In fact, they have admitted in writing that "The doctrines of the Catholic Church are entirely independent of Holy Scripture." (Familiar Explanation of Catholic Doctrine, Rev. M. Muller, p.151) And so again, who is more trustworthy? The God of the Bible? Or the men the Bible defines by using many prophecies and historic records as being Antichrist? I recall as a very young Catholic boy in parochial school asking the nun one day to explain Purgatory to me because it scared me to death! I loved the Lord as a child and I simply couldn't believe He would be so mean and hateful. She looked me straight in the eyes and said with a stern look on her face that the flames are very real and I was destined to burn in those real flames as long as it takes just so I could get ready to be in God's holy presence. That's all she or any priest would ever say about it. And when asked to give more details they would tell me that the common man cannot possibly understand what the leaders in the church do unless they dedicate their lives to God as they did. And so of course as a little boy I was left with no choice but to trust them over the Lord I loved and I began to fear God in a way that confused me about how His love was truly defined by Him even as a child. Their strange theology never stopped me from loving or even praying to Him as I did often in the prairies of Illinois even as a boy. But it was part and parcel to the reason I rebelled from the God I loved in a big way in my teenage years. And yes, this is what Catholicism, and especially the doctrine of Purgatory is designed to do all along. This doctrine not only states it's useless to try and be perfect because even if you were you're still not able to stand before God without first burning in Purgatory for millions of years; the other toss of the coin is that their false doctrine also creates hate in the hearts of billions because they see no love in the God of Heaven when He promises to put His people and their loved ones in Purgatory just to be ready to be in His presence and then His eternal kingdom. But ask your priest and nun this. If we all need the cleansing of the purgatorial flames to be in the presence of the Lord, why is it nary a single soul felt so much as the heat of a candle flame when Jesus walked among us 2000 years ago? My Bible says in Hebrews 13:8 that "Jesus Christ the same yesterday, and to day, and for ever." Not a single Purgatorial flicker ever came from His loving presence 2000 years ago, and since he never changes, it will never be needed to gain His loving presence in the future. The Vatican was actually built on from donations they conned out of the poor people they scared into giving by a German Monk named John Tetzel who said they had to give to get their loved ones and themselves out of Purgatory. In February of 2009 Pope Benedict IVI reinstituted the selling of indulgences for Catholics to gain time off in Purgatory if they gave cold hard cash to the Pope.